This easy-to-wear yet edgy piece makes for an elegant silhouette with a breezy culotte feel and sleeveless top. Featured here in the monochrome Rana print, beloved for its slight asymmetry and midnight tone. Pair with our Singapore Solar Yellow scarf for a pop of colour. PS - If you need some tips, here are 3 ways to wear the Classic Jumpsuit. Thank you for doing amazing work! 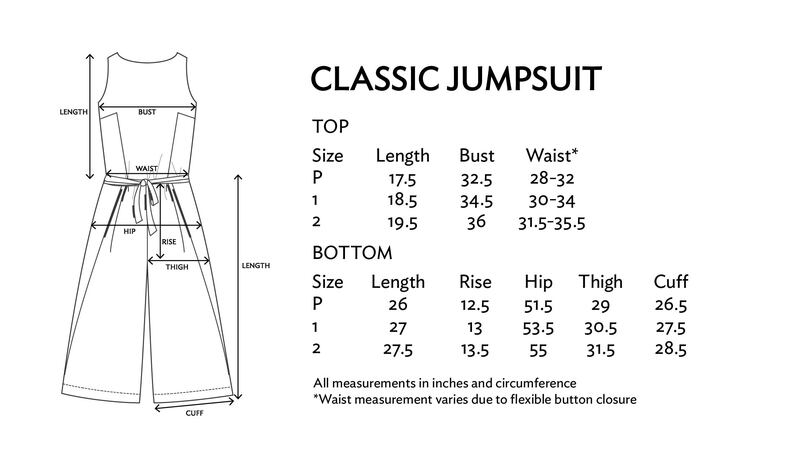 The jumpsuit is perfect size for me (159cm). I wear it all the time. Loved the jumpsuit. Beautiful print and design. I do have a longer torso and wished that the jumpsuit had a bit more fabric length in the torso. Pockets would have been perfect - I feel cool and casual in this suit, which always makes me want to put my hands in my pockets. I also need pockets to hold all the small things my two young children give me... The print is beautiful and easy, and feels just right in many settings. I recently wore the jumpsuit on vacation in Kota Kinabalu and it was both breezy enough and dressy enough to wear for dinner. Despite the fact that measures have been taken to make this jumpsuit easy to use the washroom while wearing, I find it tedious. I mostly hate trying to tighten the belt, but maybe when I've worked the side buttons in a little more I will feel that is at least easier. I am perfectly happy to be braless in this suit, and appreciate that there are two buttons to adjust the tightness of the top. Thank you for your attention to detail, and for all that Matter stands for. I do hope to buy a piece again, when my closet beckons sometime. Wardrobe fav - easy to take from day to nite! One of my wardrobe favs!! So comfy and easy to take from day to nite! Looks flattering for a pear shaped body too. Really love it!! The only thing is the strap can be tricky to manage when bathroom floor is wet! But overall, LOVE!! The top can be a little loose, so restitch your button if you prefer a tighter fit. For those who like a roomier fit around their arms, opt for the size above. The bottoms are designed like our Lounge Lunghi pants, meaning you can wrap and tie them three different ways.